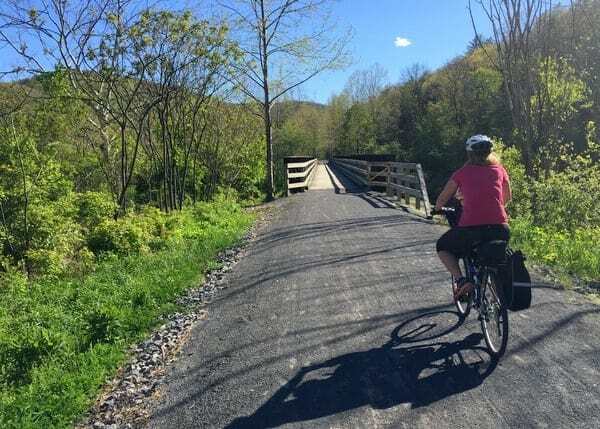 Pennsylvania is home to more than 1,000 miles of rail trails, but none may be more beautiful than the Pine Creek Rail Trail in Tioga County. 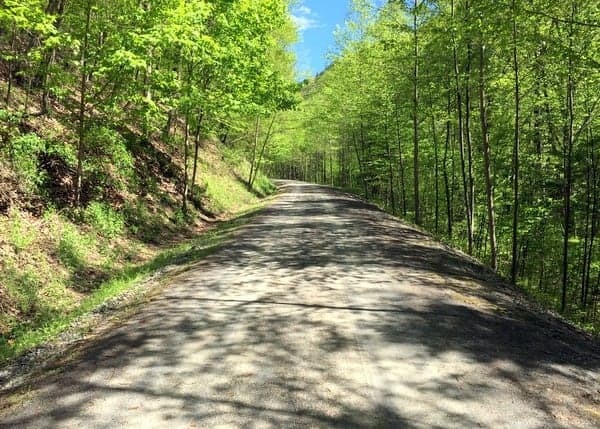 The Pine Creek Rail Trail travels more than 60 miles through the Pennsylvania Grand Canyon, also known as the Pine Creek Gorge. Visitors come the world over to ride this amazing trail, which features towering cliffs, beautiful scenery, and hidden waterfalls. While it’s possible to do the trail over the span of two days, many, including myself and my family, opt to simply do a day trip on the trail. The Pine Creek Rail Trail as seen at the bottom of the Turkey Path in Leonard Harrison State Park. To assist with the trip, I talked with Pine Creek Outfitters. 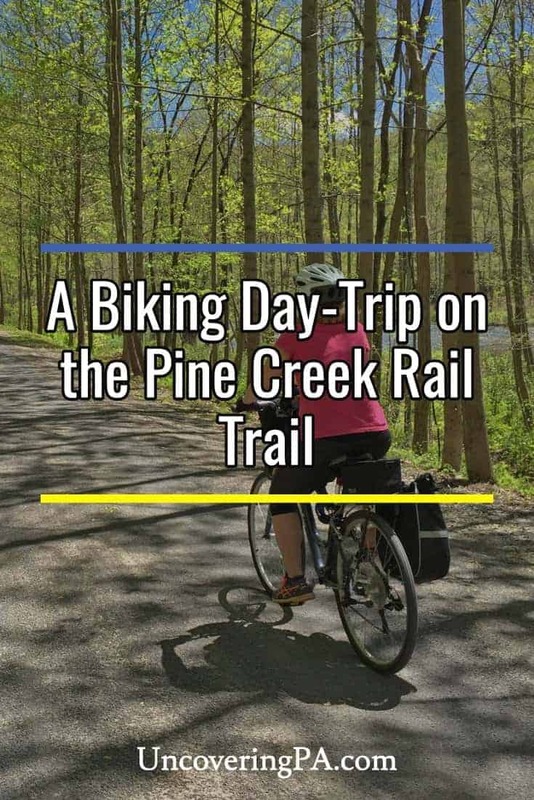 Pine Creek Outfitters offers bike rentals and shuttles on the Pine Creek Rail Trail. They also offer guided rafting trips and kayak rentals for those wanting to experience the canyon by water. In addition to traditional shuttles, one service that Pine Creek Outfitters offers is to shuttle your own vehicle to your pickup point. If you have your own bikes this is great as you don’t have to prearrange a meeting time with a shuttle driver, and, if you’re heading south, you can simply continue on your way without having to return to the northern reaches of the canyon. Beautiful scenery along the Pine Creek Rail Trail. Accompanying me on this trip was my wife and two-year old son. While we have previously biked the Great Allegheny Passage in southwestern Pennsylvania, neither of us are major bikers. If we can do this trail with a toddler, nearly anyone in reasonable shape can complete this amazing journey. The trail at the Ansonia Access Area along Route 6. 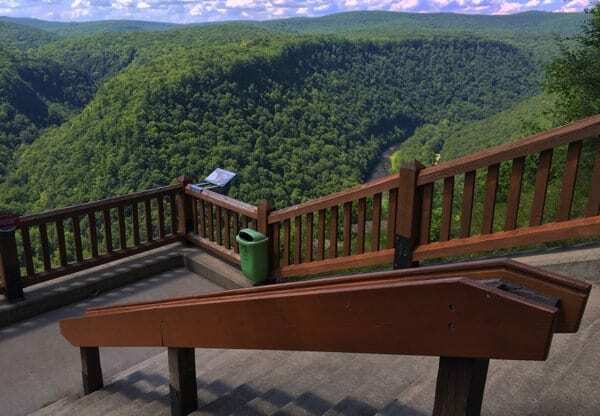 From the Ansonia Access Area to the Rattlesnake Rock Access Area, it’s a 19-mile journey through the Pennsylvania Grand Canyon. While there are a few short sections with minor uphill grades, the vast majority of the journey is at a slight downhill. While it’s not enough to coast, the slope does help to make things a bit easier traveling downstream, than if you were to start in the south and head north. 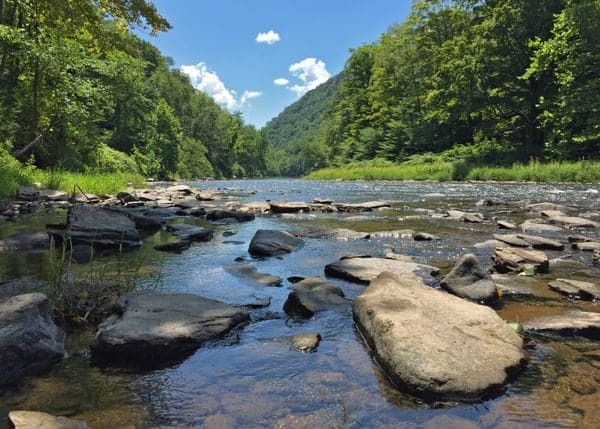 The confluence of Pine Creek and Marsh Creek marks the start of the Pennsylvania Grand Canyon. Just a little over a mile from the Ansonia Access Area is the Darling Run Access Area. This is a popular spot for starting rides along the trail. However, if you start here, you miss the start of the Pennsylvania Grand Canyon at the confluence of Pine Creek and Marsh Creek. That being said, the Darling Run Access Area is the closest access point to downtown Wellsboro. The Darling Run Access Area offers bathrooms and an information station. 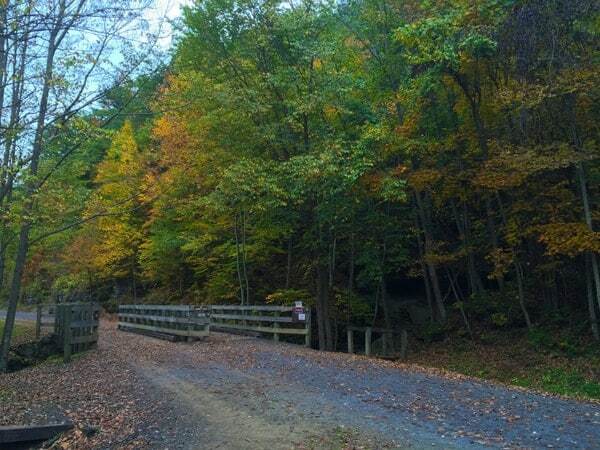 The Darling Run Access Area is also a good starting point for walks into the PA Grand Canyon. Biking on from Darling Run, the mountains quickly climb higher and higher until you are soon deep into the Pennsylvania Grand Canyon. On the opposite bank, Owassee Road parallels the trail for the next two miles. 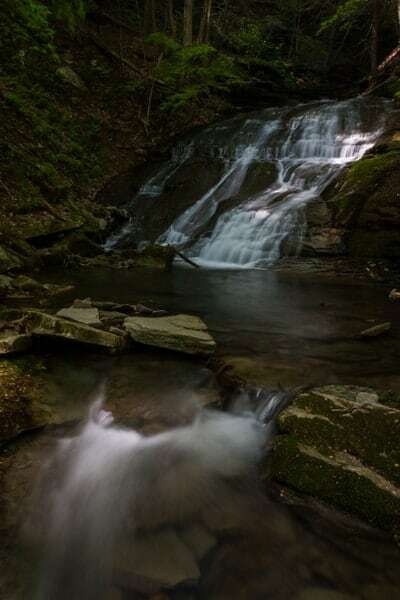 This roadway gives access to the western banks of the creek for some beautiful cabins, fishermen, and those wanting to visit the seasonal Chimney Hollow Falls. Just beyond the end of the roadway, there is a small grouping of cabins. These cabins have strung up a gated swinging bridge over Pine Creek. This has to be one of the coolest setups that I’ve ever seen for a cabin. Cabins and kayakers near the northern reaches of the Pennsylvania Grand Canyon. Just beyond the swinging bridge, you’ll enter Leonard Harrison State Park. This park occupies the eastern rim of the canyon with Colton Point State Park occupying the western side. Three and a half miles after passing the Darling Run Access Area, you’ll come to a bridge over Little Four Mile Run. This bridge marks the end of the Turkey Path, a steep trail that climbs 800 feet in a mile. One of the waterfalls along the Turkey Path in Leonard Harrison State Park. Park your bike here and take a walk up this amazing trail. The first half of the trail is a series of stairs and boardwalks that passes by three beautiful waterfalls. The lowest can be seen from the trail, and the last and tallest of the three can be seen by hiking less than half a mile up the trail. If you want to check out the amazing vista at Leonard Harrison State Park, continue walking up the hill when the trail turns away from the creek. Otherwise, you can return the way you came. If you’ve never seen this view, it’s well worth the challenging climb. However, if you have time, it’s much easier to drive to this handicapped-accessible overlook. The view from the top of the Turkey Path is stunning. Back on your bike, the Pine Creek Rail Trail continues to wind its way through the Pennsylvania Grand Canyon. 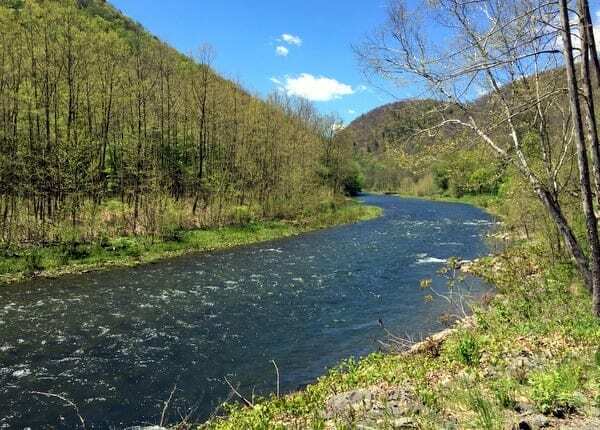 Along the way, you’ll see some of the most beautiful scenery in PA. As we were riding, my wife and I were continually amazed by the majesty of the canyon’s beauty. 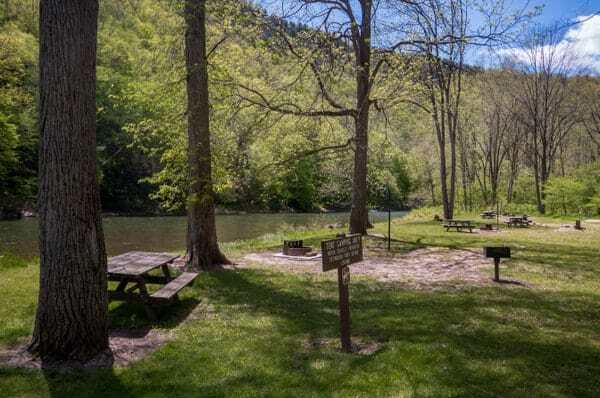 The next point of interest worth stopping at is Tiadaghton Campground, which is just over four miles south of the Turkey Path at Leonard Harrison State Park. Enjoying a great bike ride on the Pine Creek Rail Trail. Tiadaghton Campground sits on the site of a community that was once in the canyon. Today, it is a campground run by the Department of Conservation and Natural Resources. While there is road access to this point, cars are not allowed to stay here overnight, making the campground only open to those traveling through the Pennsylvania Grand Canyon. 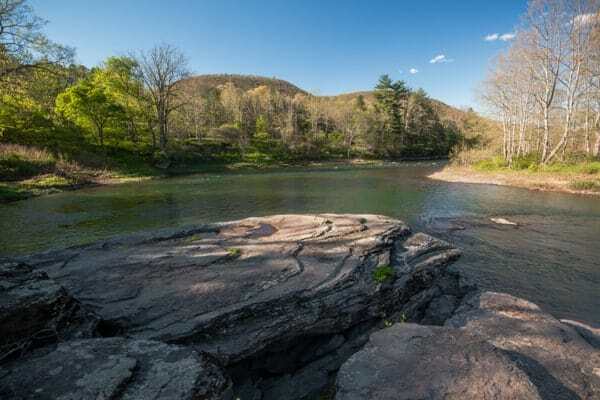 The Pennsylvania Grand Canyon at Tiadaghton Campground. 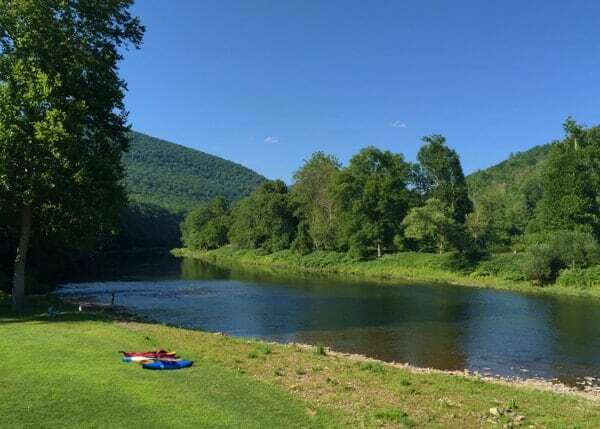 To be honest, I have yet to come across a campground in Pennsylvania that is set in such a gorgeous spot. My wife and I agreed that we will someday come back to camp at this spot. I can only imagine what a great place this would be to stay on the Pine Creek Rail Trail. Even if you aren’t camping at Tiadaghton Campground, this is still a great place to stop. 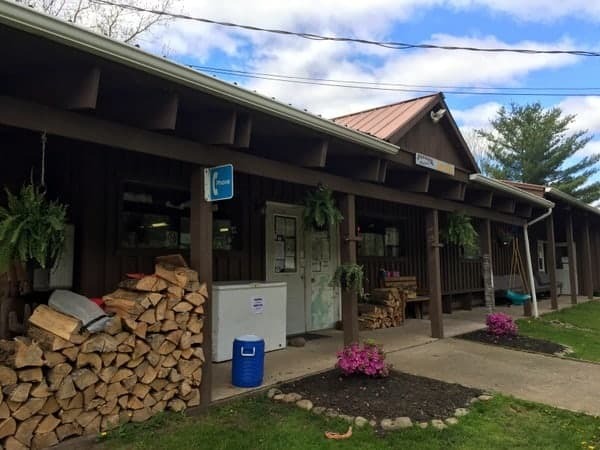 Not only is it home to some of the cleanest state forest bathrooms you’ll find, but it also features picnic tables, making this a great place to stop for lunch or just a quick break. The beauty of the Pine Creek Rail Trail continues as you travel south beyond Tiadaghton Campground. Many of the creeks south of this area feature beautiful waterfalls. Some of these can be seen from the rail trail itself, while others require a bit of hiking. The Pine Creek Rail Trail is filled with beautiful scenery. One great example is Pine Island Run. 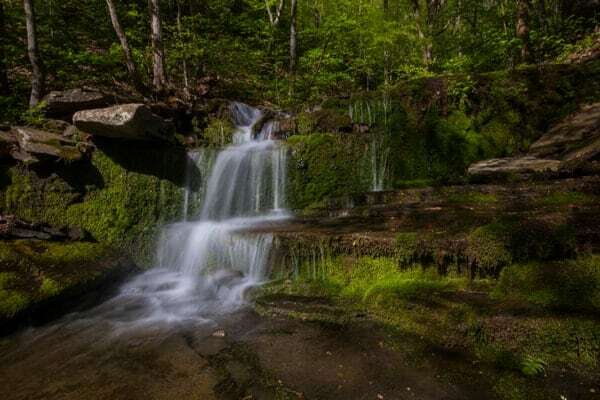 Located four miles south of Tiadaghton, this stream is home to three easy-to-reach waterfalls, though they cannot be seen from the trail. To see these waterfalls, park your bike next to the bridge, which features a sign naming the creek. For those traveling with a GPS, the bridge can be found at the following coordinates: 41.610180, -77.406766. If you’re traveling south (downstream along Pine Creek), there is a small trail that goes into the woods just before the bridge. While this trail is a little overgrown at the rail trail, it is easy to follow as it travels above the creek along the ridgeline. The rail trail at Pine Island Run. As you travel around the corner, look across the creek to a small stream that tumbles down the hill into Pine Island Run. If water levels are high, this creek is impressive as it cascades 75 feet or so down the hillside. Continuing up the trail for another minute or so will bring you to the three slides that make up Pine Island Run Falls. These slides range from about 10-20 feet in height and are very worth the short hike to see when water levels are high. The lowest and tallest of the three waterfalls on Pine Island Run. Even more impressive than the waterfalls of Pine Island Run is the waterfall on Water Tank Run, which sits two miles further south. Along the way, waterfalls on Benjamin Hollow and Clay Mine Run are visible from the trail. Water Tank Run Falls is definitely one of the most impressive waterfalls in the Pennsylvania Grand Canyon. 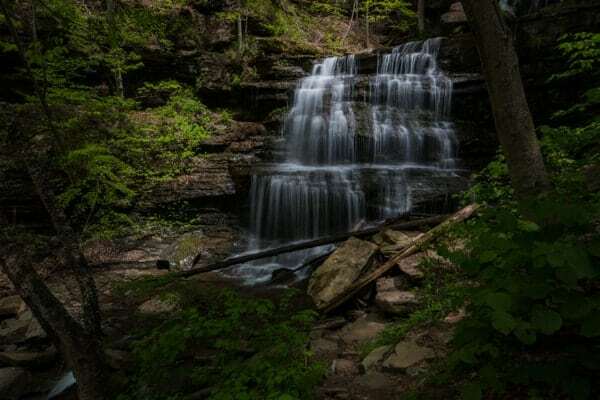 This 30-foot waterfall can be seen from the trail, but it’s even better to see up close. A trail heads upstream from just past the bridge over the creek. The bridge can be found at the following coordinates: 41.588745, -77.385519. The very impressive Water Tank Run Falls. Follow the trail upstream for a few hundred yards to the base of this impressive waterfall. Even during times of somewhat high water, the water next to this waterfall is pretty shallow, making this a great place to cool off if you are so inclined. One mile south of Water Tank Run is Stone Quarry Run. This stream has a beautiful waterfall directly next to the trail that’s worth stopping to see. 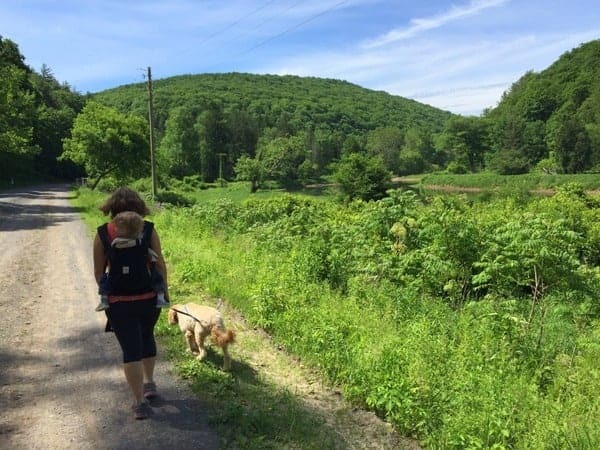 It is also where the Mid-State Trail, PA’s longest hiking trail, meets the Pine Creek Rail Trail. The small, but beautiful Stone Quarry Run Falls. From this point, you are only one mile north of Blackwell, a small community in the PA Grand Canyon. Here, visitors will find a parking area and a small general store. This is the first place to get food and bottled water along the trail. 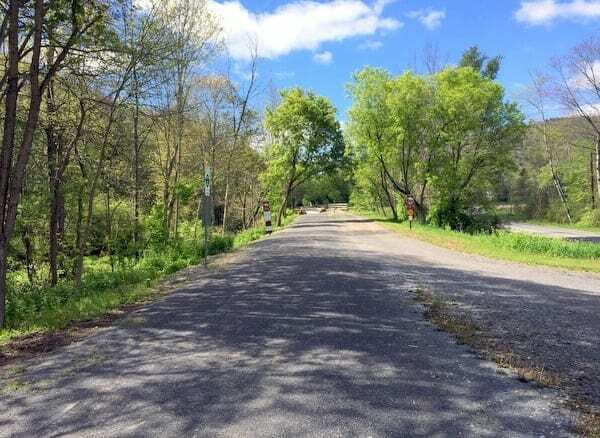 Sitting 17.2 miles south of the Ansonia Access Area, the Blackwell Access Area is a great place to end your bike ride on the Pine Creek Rail Trail. Much of the best scenery sits between these two points, and Blackwell is a great jumping off point to head to your next destination. 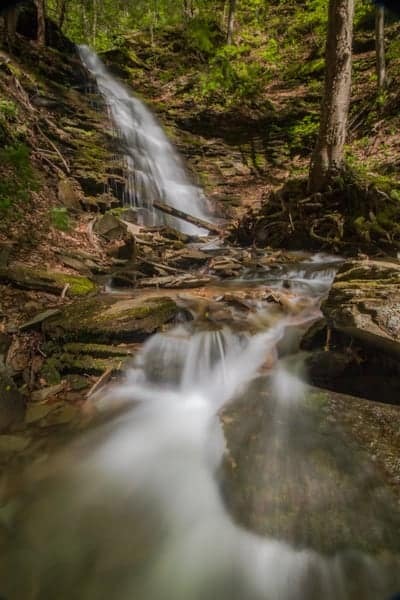 If you want to do some hiking, you can also check out the waterfalls along Jerrys and Bohen Run from here. Riding into Blackwell on the Pine Creek Rail Trail. If you want to bike a bit further, as we did, you can travel an additional 1.8 miles to the Rattlesnake Rock Access Area. Beyond Blackwell, the scenery changes, with the canyon opening up and the rail trail traveling a bit away from Pine Creek. The best part about biking to the Rattlesnake Rock Access Area is the opportunity to check out Rattlesnake Rock. Rattlesnake Rock is a large rock on Pine Creek that visitors can explore. You’ll be able to see the rock shortly before reaching the parking area. There is a small, unmarked trail that heads off towards the rock. 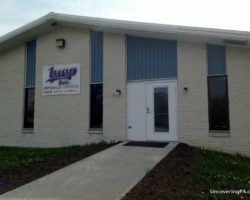 it is located directly across the rail trail from the path to the parking area. Rattlesnake Rock is a great place to end your Pine Creek Rail Trail Journey. 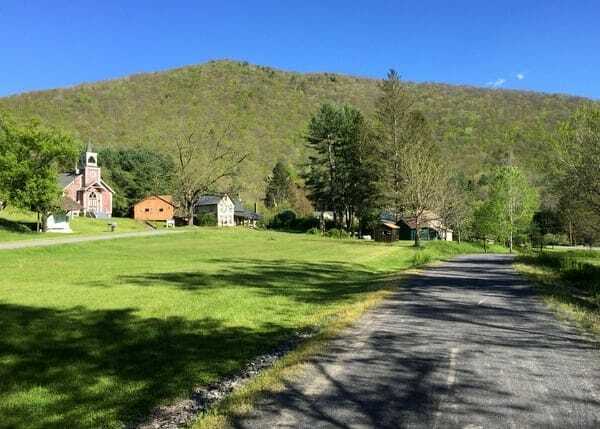 Rattlesnake Rock is located just a hundred yards or so down the trail and offers a beautiful and relaxing way to end your day trip on the Pine Creek Rail Trail. 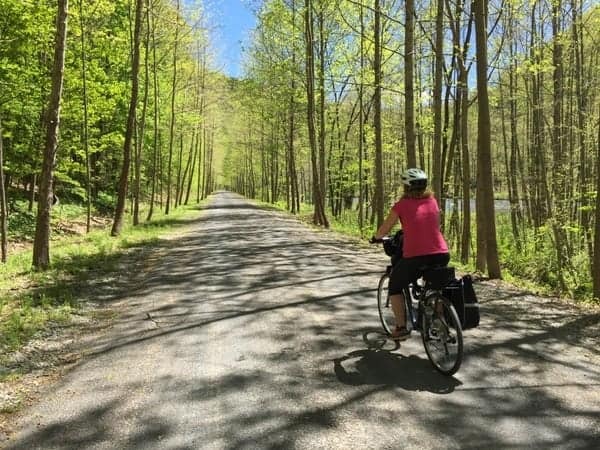 Without a doubt, the upper third of the Pine Creek Rail Trail passes through some of the most beautiful scenery in Pennsylvania. 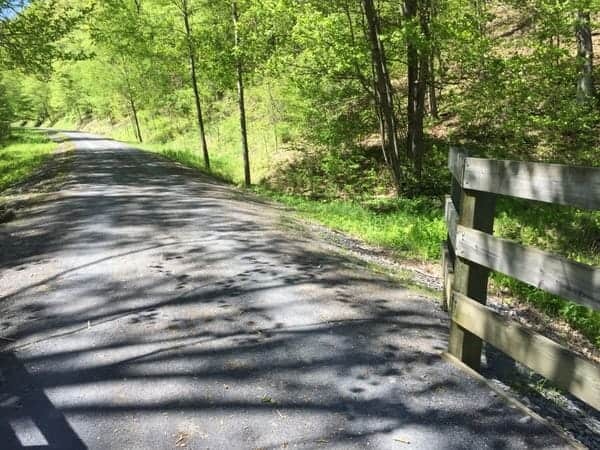 The imposing views of the surrounding mountains, the beautiful waterfalls, and the peacefulness of this area make for one of the, if not the, best places to bike in Pennsylvania. 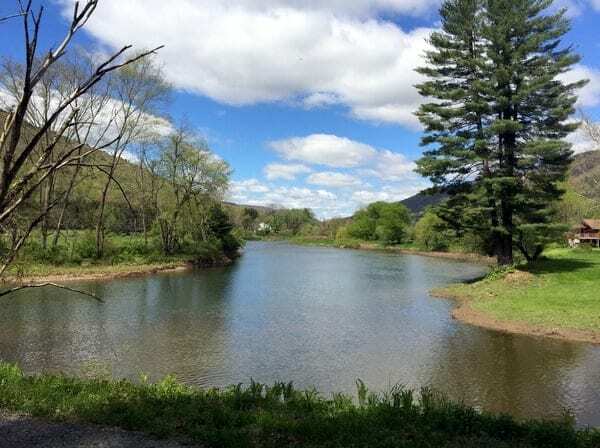 Those wanting to bike further can continue on the Pine Creek Rail Trail for another 35 miles until it meets the West Branch of the Susquehanna River in Jersey Shore, PA. Along the way, there are several communities with places to stay or to grab a bite to eat. 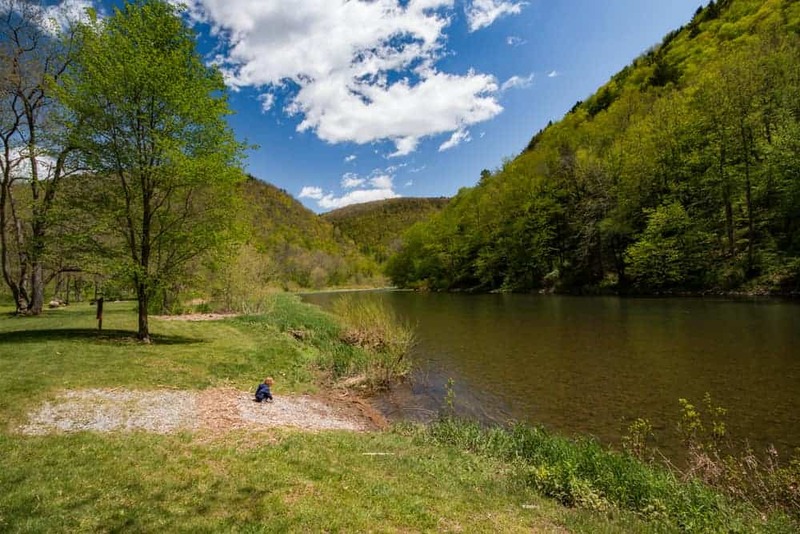 Beautiful scenery awaits those who opt to bike into the lower part of Pine Creek Gorge. 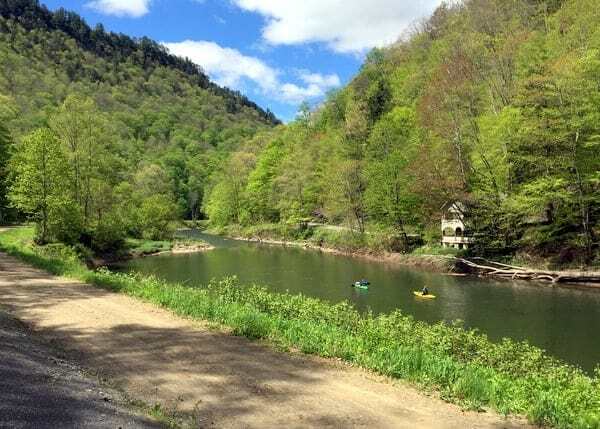 However, for those looking for a taste of the best scenery in northern PA, you won’t want to miss a fantastic day trip biking the Pine Creek Gorge through the Pennsylvania Grand Canyon. Pine Creek Outfitters offers rentals and shuttles. If you are looking to get a Pine Creek Rail Trail shuttle, you’ll want to get in touch with Pine Creek Outfitters. They are located less than a mile west of the Ansonia Access Area on Route 6. Pine Creek Outfitters provided me with a complimentary shuttle for this trip, but I was very impressed with their offerings and wouldn’t hesitate to recommend them. 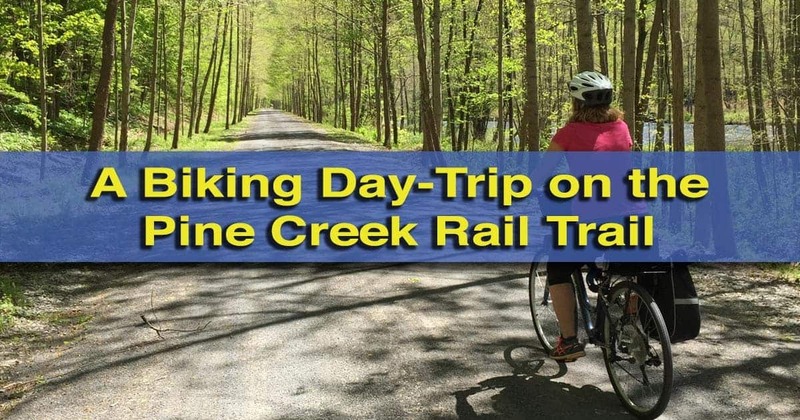 Pine Creek Outfitters offers bike rentals and shuttles for those biking a portion or the entirety of the Pine Creek Rail Trail. If you have your own bike, one great option is to have them shuttle your car to your finishing point. In addition to not having to meet a shuttle at a specific time, freeing you to take your time and enjoy your journey, it also is an inexpensive way to more directly head to your next destination. 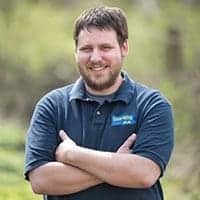 So, if you are looking for a shuttle on the Pine Creek Rail Trail, or if you want to rent bikes or go on a boat ride on the creek, make sure to check out Pine Creek Outfitters. 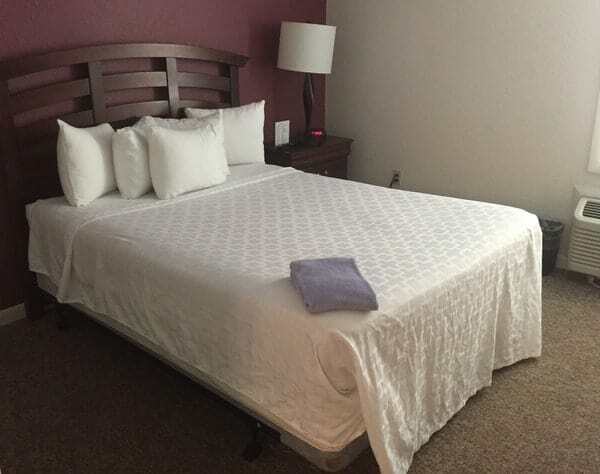 The Canyon Motel is a great choice when staying in Wellsboro. The remoteness of the Pine Creek Rail Trail is much of the appeal, but it can also make it difficult if you are trying to find lodging on the Pine Creek Rail Trail. The best place to stay before your trip is in Wellsboro. During my visit, I was invited to stay at the Canyon Motel. I found this hotel to be the perfect place to relax before and after biking the rail trail. 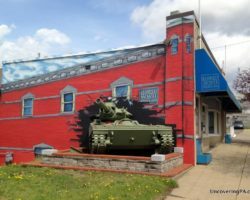 It was not only within walking distance of many of the restaurants and shops in downtown Wellsboro, but their indoor pool and hot tub are perfect for relaxing tired muscles. 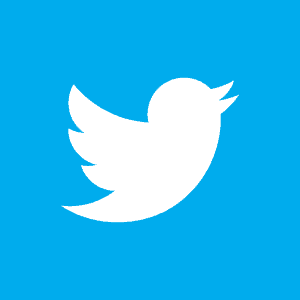 You can check out their website here, or read other user reviews on TripAdvisor (Affiliate Link). Tiadaghton Campground is a great choice for those wanting to camp along the Pine Creek Rail Trail. If you are looking for lodging on the trail, there are several campgrounds on the Pine Creek Rail Trail. To stay at a campground in the state forest, like Tiadaghton Campground, contact the Department of Conservation and Natural Resources. There are also several privately run campgrounds along the trail. Hotels and bed and breakfasts can be found in a few places along the trail including Cedar Run, Slate Run, and Waterville. I’ve never stayed at any of these, but the food is very good at Hotel Manor in Slate Run. Pine Creek makes its way through the Pennsylvania Grand Canyon near the end of the Turkey Path. 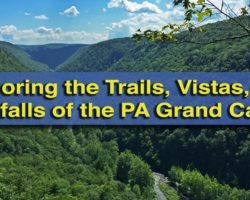 There are a few other points I thought I should note regarding biking the Pine Creek Rail Trail through the Pennsylvania Grand Canyon. While there is water available at several places, this water isn’t tested for contaminants. When I filled a bottle at the Tiadaghton Campground, it was very dirty and seemed unfit to drink. Make sure you pack enough water to get you through your entire trip. You may see wildlife while biking the Pine Creek Rail Trail. Even though I biked it on a fairly cool day in May, I still saw three snakes on the trail, including a rattlesnake. Make sure to respect any animals that you see and keep your distance. Biking the Pine Creek Rail Trail is perfect for the whole family. It should also be noted that there is no cell service throughout much of the Pennsylvania Grand Canyon. Should you have an accident, get injured, need a flat repaired, etc, you are unlikely to be able to call for help. Make sure to take necessary precautions before leaving home. If you want an even more detailed guide to biking the Pennsylvania Grand Canyon, check out “The Pine Creek Rail-Trail Guidebook” by Linda Stager on Amazon (Affiliate Link). You can see a basic Pine Creek Rail Trail map here, but pick up the much more detailed one available at several places in town and along the trail if you plan to do any hiking. Have you ever biked the Pine Creek Rail Trail? Comment below with your thoughts and suggestions. 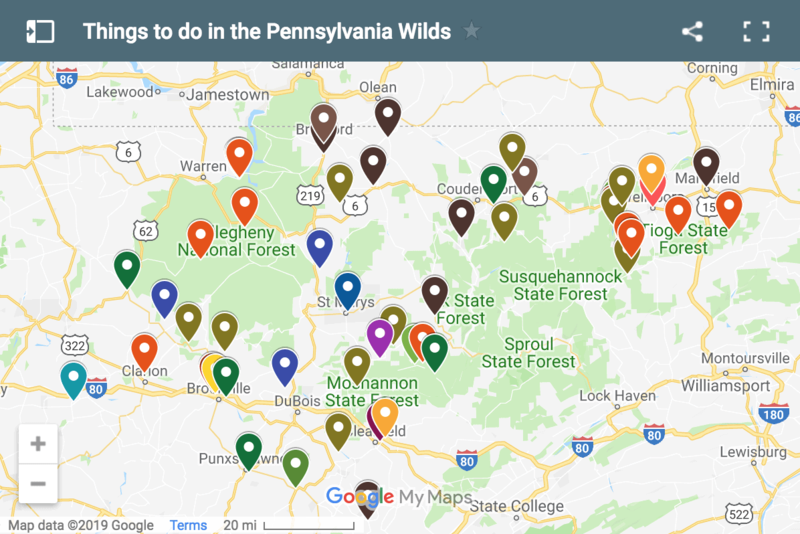 Looking for other biking adventuring in Pennsylvania? Check out the Great Allegheny Passage in southwestern PA or go mountain biking on the Allegrippis Trails in Huntindgon County. 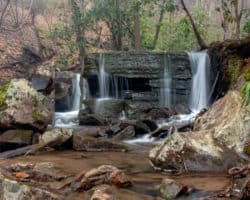 If you’re looking for more great places to visit in the area, try hiking to Barbour Rock or visit the sources of Pine Creek at the Triple Continental Divide. Just a quick warning about the waterfalls south of Tiadaghton. That is prime rattlesnake den property. I point that out in the guidebook and I don’t recommend anyone visit those falls during warm months. If someone gets hurt there, it is a long time being rescued. Rescuers have to come from far away and as you know there is no cell coverage In that area. That means your friend(s) need to ride out and find a phone which is many miles away, in order to call for help. And the truth is, all of these falls dry up in the summer anyway, so visitors will be pretty disappointed once they make the effort to get there. Just sayin’…. Linda, Thanks so much for that information. Definitely good for people to know, as I obviously wouldn’t want anyone getting hurt. My favorite trail! My group of friends and I will be doing our annual 100k the end of June! Wellsboro to Jersey shore. Age range is 59-76 years young! this sounds like so much fun! Let me know when you are going and i will be there to cheer you on! My wife and I often camp at the campground between Rattlesnake Rock and Blackwell. Swimming at the rock is great fun, too. 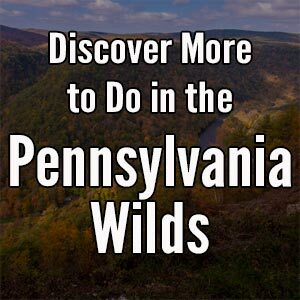 A group of friends are very interested in doing a pack trip on horses, through the PA Grand Canyon in the spring of 2018. Can’t wait to experience all the beauty of our great state Pennsylvania. I love the Pine Creek Trail- the biking is wonderful and there is always something wonderful to see- some good place to eat along the way- and lots of good memories! Linda Stager’s book is the best! thanks for listing this!!! Wellsboro is a great little town too!! !